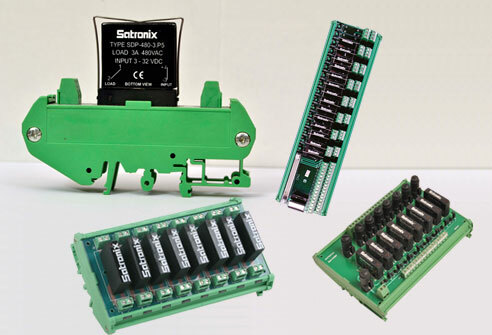 SATRONIX introduces a range of I/O modules to meet demands of the industrial control market. These I/O modules are self‐contained and include power terminals, status LED indication for each relay. I/P & O/P are optically isolated. Individual fuses are provided in series with the O/P. Internal transient suppression. Universal mounting base by Phoenix Contact. Chassis mounting and Din rail mounting using same base. PCB can also be mounted directly. SRM and peripheral components complete the wiring to these components together with individual data lines and common busing to the controller via (D‐type/FRC connector and RS 232 cable or edge connector available with the module). The module contains all the necessary circuitry to provide complete interface between controller and load without the need for further design or additional circuitry. Available in options of1, 4, 8, 16 & 24 SSRís.